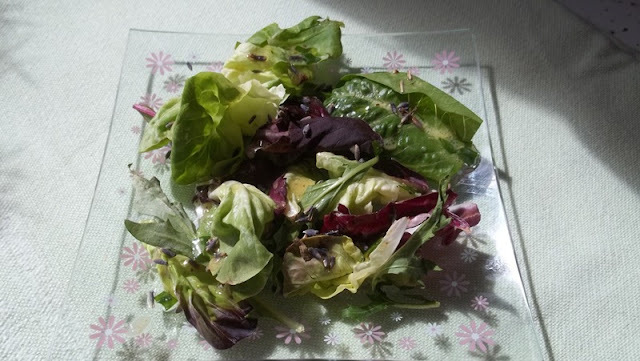 My sister was bringing salad for dinner...a lavender vinaigrette would be a wonderful dressing! I love homemade dressings. They take so little time to throw together, yet add such an incredible amount of flavor to a salad. 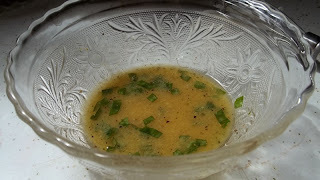 I also had some ramps that I was lucky enough to find while camping, so I decided to add chopped ramp leaves to balance the sweetness of the oil. This recipe was also for a small amount....perfect for just a couple of salads, but easily increased. Mix all ingredients & dress salad greens. Also very nice on fruit salad.